The mysterious mountain range with the most abundant snow blanket and the highest situated point in the republic at the top of the Praděd transmitter tower. Magical Petrovy kameny rocks, cosy Švýcárna chalet or romantic Bílá Opava waterfalls. All these can be found in the Jeseníky mountain range offering breath-taking views from its highest peaks at the boundary of Polish and Czech Silesia, Eastern Bohemia and Northern Moravia. Since 1996 these dominant features inseparably adherent to the Jeseníky also include an imposing man-made work. The Dlouhé Stráně pumped storage hydro power plant occupies the highest places in various surveys regularly – the Czech Republic best, 7 wonders of the Olomouc region, the Czech Republic wonder etc. It is not very common for a piece of technical work to become one of the symbols of the whole region and its mountains in a relatively short time of its existence. Judging by the interest of more than 60 thousand enthusiastic visitors interested in the tour who arrive every year, it is clear that Dlouhé Stráně won the favour of visitors long ago. The diagram of the Dlouhé Stráně pumped storage hydro power plant and small hydro power plant. The diagram of the underground power plant engine room. The reversing Francis turbine construction diagram. The power industry work derives its name from the original name of the mountain the top of which was artificially reduced by approx. 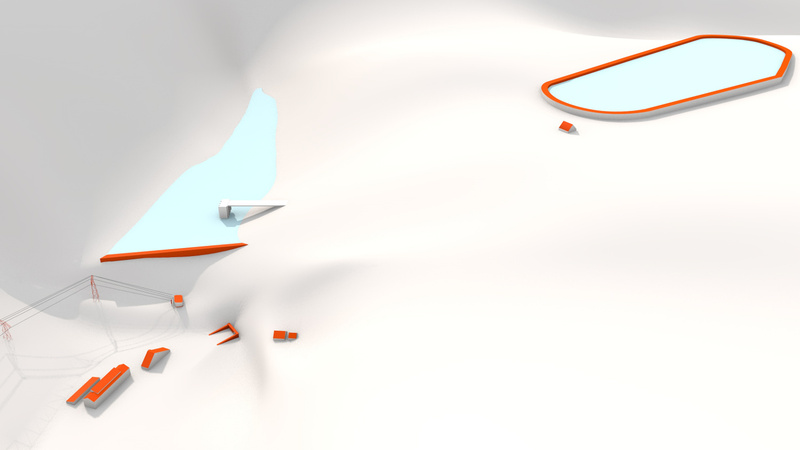 3 metres to incorporate a huge „basin“ which forms the upper reservoir of the pumped storage power plant. For years its conquering was considered a decent physical accomplishment of a cyclist or hiker. Since December 2010, the journey to the dam is more comfortable thanks to a unique six-chair lift in the Czech Republic, which transports the mountain lovers from Kouty nad Desnou as far as the foot of Medvědí hora; from there its approximately 2 kilometres to the reservoir. The panorama you can enjoy from the reservoir never wearies and in nice weather you will be rewarded by distant views. While to the south you can see the Czech lowland around Šumperk and Zábřeh na Moravě, the main range of the Hrubý Jeseník with mountains Vysoká hole (1464 metres above s. l.), Petrovy kameny (1446 metres above s. l.) and Praděd (1491 metres above s. l.) lies open to the east. In the valley right between the Praděd massif and Dlouhé Stráně there is a calm surface of the lower pumped storage power plant including a small Dlouhé Stráně II power plant. An asphalt road winds wildly uphill. The northern azimuth takes the eyesight of the attentive observer back to the main ridgeway Praděd – Švýcárna – Malý Jezerník – Výrovka descending to Červenohorské sedlo (1013 metres above s. l.). In the north-western direction, after the propellers of three wind power plants of the former renewable resource park at Mravenečník, you can surmise the valley of the Desná and further on the horizon the massif of the boundary Kralický Sněžník (1424 metres above s. l.). 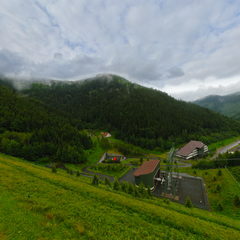 Significantly closer there is a steeply rising range of the Jeseníky to the right, with the peaks including those of: Vozka (1377 metres above s. l.), Keprník (1423 metres above s. l.) and Červená hora (1333 metres above s. l.), which then declines again to Ramzovské sedlo. The Dlouhé Stráně pumped storage hydro power plant has three best: the largest turbine unit with reversing turbine in Europe (325 MW), the highest water head in Europe (510 m) and it is the hydro power plant with the highest total generating capacity in the Czech Republic – 650 MW. It was rightly chosen the greatest wonder of the Czech Republic in the survey. The power plant carries out several significant functions in the electric power system – static, dynamic and compensation. The static function means the transformation of excess energy to peak energy – at the time of electric power surplus in the network (mainly at night) the water is pumped from the lower reservoir to the upper one and at the peaks, at the time of power shortage, the turbine mode is used to generate electric power. The dynamic function of the pumped storage hydro power plant means the capability to function as a power reserve in the system, to generate regulating output and energy. The compensation operation is used to regulate voltage in the network. The power plant construction started in May 1978. However, at the beginning of the 1980s, the central authorities decided to transfer the project to the inhibition programme. In 1985, the project was upgraded and after 1989 the decision was made to complete the construction. The power plant was put into operation in 1996. The power plant is designed as an underground work. Both turbine units are located underground, in a cavern of 87.15 x 25.5 x 50 m. A transformer gallery is placed in parallel with the turbine cavern underground as well; its dimensions are 117 x 16 x 21.7 m. This gallery contains two three-phase unit transformers 22/400 kV, as well as station auxiliary transformers 22/10,5 kV, substations 22 kV and other machinery. 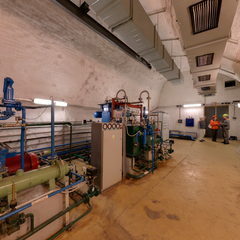 The upper reservoir is connected to the underground power plant with two feeder channels, each for one turbine unit. The feeder channels are 1 547 m and 1 499 m long. The power plant is connected to the lower reservoir by two tail race tunnels with 5.2 m in diameter. The tunnels are 354 and 390 metres long. 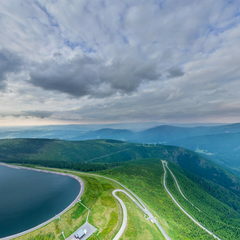 The upper reservoir is located on the top of the Dlouhé Stráně mountain at 1350 m above sea level. Its total volume is 2.72 mil. m3. Power generation as well as pumping is provided by two reversing turbine units, each with the output of 325 MW. The reversing turbine output in the pumping mode is 312 MW, while in turbine mode it is up to 325 MW. In addition to the administrative building with the control room, the surface premises include the structure of the feeder with the 400 kV metal-clad substation, workshops and storage rooms, garages, sewage water treatment plant and water purification plant. The levels in water reservoirs drop or raise with as much as 20-metre difference during the operation depending on the activity of one or both turbine units. 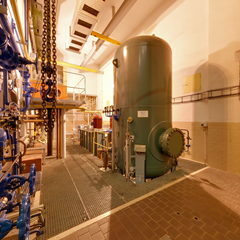 The machine output is controlled by the ČEZ control room from Prague in cooperation with Česká přenosová (ČEPS). The lower reservoir is located on the Divoká Desná river at 824.7 metres above sea level. The total reservoir capacity is 3.405 mil. cubic metres and its area is 16.3 hectares. The dam is 56 metres high and water-level fluctuation in the pumping mode is 22.2 metres. From the dam there is a view of the structures of the 400 kV substation, control room and the entrance of the underground power plant premises that are located on the lower level. The power is evacuated from the power plant to the electric power network using 400kV cable conductors to the enclosed feeder. From there is it conducted using overhead line through the valley to Kouty nad Desnou and after 52 km it ends its journey in the Krasíkov substation. The Dlouhé Stráně pumped storage hydro power plant is controlled from the central ČEZ and ČEPS control stations in close link to the control of the whole electric power system of the Czech Republic. Its supervision has three levels. The first level of supervision is right at the machinery. 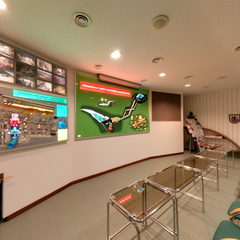 The second level of supervision is provided by a central control room, which ensures comprehensive supervision of the power plant using a control system, a security system and a CCTV system. 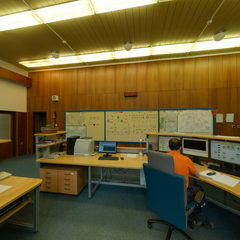 On the third, highest, level there is the non-stop operating ČEZ and ČEPS control station. The Information Centre of the Dlouhé Stráně Pumped Storage Hydro Power Plant is open daily all year round (including Saturdays, Sundays and public holidays) from 8 a.m. to 5 p.m. The contact point for the ordering of tours is located in the Kouty Ski Resort in Kouty nad Desnou. The places can only be booked on-line at www.dlouhe-strane.cz. We provide information at phone numbers 602 322 244 or 583 283 282 every day from 8 a.m. to 4 p.m. or individually in the Kouty Ski Resort. For organisational reasons the visitors interested in the tour have to make a reservation on-line in advance at www.dlouhe-strane.cz. In case of inquiries, you can phone at: 602 322 244 or 583 283 282. The IC can handle 10 tours a day, their number depends on the interest of visitors. The tours always start on the hour from 8 a.m. to 5 p.m.; we recommend that you come to the Kouty Ski Resort with the printed ticket at least 10 minutes before the start of the tour. The boarding place for the tours of the ČEZ Information Centre and the Dlouhé Stráně Pumped Storage Hydro Power Plant is at the sports shop at the Kouty Ski Resort. From there the tour participants together with the guide shall be transferred by a special bus to the power plant premises, where they can watch a film in the information centre and listen to the guide’s presentation. They will visit the underground and the power plant cavern together. Then they will be transferred to the lower reservoir by bus and after 2 hours they will drive back to the Kouty Ski Resort. Twice a day (11 a.m and 2 p.m.) the tours are organised including the drive up to the upper reservoir; this tour takes 2.5–3 hours and the price is increased by the transportation costs. The dogs are not permitted during the tour. Individual motor vehicle access to the power plant and reservoirs is not permitted. This is a protected landscape area and private estate. The visit of the upper reservoir need not be booked in advanced (it is not a part of the tour). The upper reservoir is accessible using a chair-lift from the Kouty resort; it will take you as far as 4 km from the reservoir. You can travel the remaining distance on foot, by bike or by bus. The chair lift is operated every day half-hourly from 9 a.m. to 5 p.m. Prams, bikes and dogs are carried for an extra of CZK 30. If you provide a proof of payment for the tour, you are automatically entitled to a discount for the chair-lift (the discount is valid until the end of the summer season, you need not take the tour and the chair-lift to the upper reservoir in a single day). Under the upper reservoir you can use a cycle track and in-line track, you can rent bikes, scooters as well as in-line skates at the Kouty resort. Option 1: a tour of the power plant in the morning (2 hours) – lunch – trip to the upper reservoir in the afternoon (2–4 hours) – note! the chair-lift operation ends at 5 p.m. Example: a tour at 9 a.m. – duration 2 hours – end at 11 a.m., a chair-lift at 12 p.m. – walk to the upper reservoir and back (4 hours), return to the chair-lift at 4 p.m.
Option 2: a chair-lift to the upper reservoir in the morning (2–4 hours) – lunch – a tour of the power plant in the afternoon (2 hours) Example: a chair-lift at 10 a.m. – by bus to the upper reservoir and back (2 hours) – back at the resort at 12 p.m. – lunch – a tour at 2 p.m. (2 hours) – end at 6 p.m.
For details and information regarding the tour organisation for groups visit the Dlouhé Stráně website. The 400 kV enclosed substation is used to evacuate power from the power plant to the Krasíkov substation (at the distance of 59 km). It consists of several elements including switches, disconnectors, earth conductors and measuring transformers. They are all enclosed in the SF6 protective atmosphere. It is divided to two zones, which are connected with generator transformers using a cable. 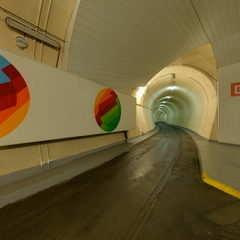 A 280 m long corridor leading to the power plant carved in the gneiss rock is lined with colour patterns. Their purpose is to relieve claustrophobia – relieve stress caused by enclosed space, both in visitors and the power plant staff. It contains three lubricant-free compressors specially manufactured for the Dlouhé Stráně power plant, which provide air to two air tanks with the capacity of 2 x 44 m3. The air from air tanks is used to expel air from the discharge casing at the start of the machine in the pumping or compensation mode. The lubricant-free compressors ensure that the water is not contaminated by oil products from air. The noise that you hear comes from the automatic diaphragm blow-down valves. The feeder channel is a steel tube with 3.6 m in diameter and wall thickness of 12 to 54 mm set into the concrete in the rock. In the places where it leads outside the rock, its walls are reinforced to 75 mm. The inspection hole is used to check the lower horizontal part of the feeder channel. As much as 68 m3 of water per second flow through the feeder channel and immediately after the inlet the water pressure is approx. 6 MPa. 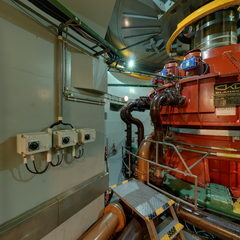 The whole generator chamber is driven deep in the rock; it is 25.50 m wide, 87.15 m long and 50 m high. The upper part of the engine room is formed by artificial lighting that simulates the outdoor environment with natural lighting. Also here, you can see the artworks livening up the power plant environment. After you enter the engine room, you can see the upper parts of the TG1 and TG2 turbine units, which consist of starting pony engines used to start the turbine units in the pumping direction. 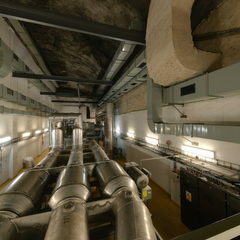 Below the upper floor there are other parts of the turbine units – generator, turbine cover, impeller and discharge casing. The turbine units are in the automatic operation, their output is controlled from the ČEZ or ČEPS control stations. The power plant staff ensure the safe and reliable operation and specify, which unit will be active. In the roof of the engine room there is a mounting hole for the hoist which is used in repairs of overhead cranes. On the engine room floor the positions of individual parts of the unit during repair are marked. These places are specially reinforced, ready to be loaded by individual machine components. 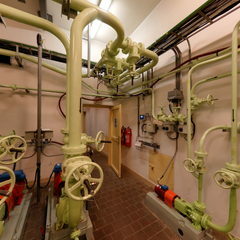 The engine room also includes a stand-by control station which is used for the inspection during normal operating walks as well as in handling the turbine unit problems. A unique space established in order to cool the generator stator which due to its high output and location in the small space cannot be only cooled using air. The generator stator has hollow conductors where the demineralised water flows and cools it down. The grey rolls are used for chemical water treatment and the date on the casing indicates the ion filter cartridge replacement date. Each arm of the lower generator star carries one brake, i.e. an air cylinder with brake lining. A steel brake ring is mounted on the generator rotor. The brake lining is pressed to the brake ring using air and that way the generator brakes. It is only used if electric brakes cannot be used. At the same time it is used to secure the machine during standstill. The ball valve is a service and inspection tightness valve located before the reversing turbine spiral and it is incorporated in the turbine unit automatics. The valve construction and servomotor dimensions enable closing up to the flow rate 75 m3/s-1 in the turbine direction and 58.5 m3/s-1 in the pumping flow direction, both in the emergency situation. The ball valve opening and closing is handled by two direct differential hydraulic motors, controlled by the pressure water from the feeder channel. 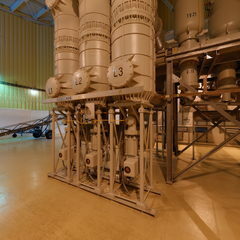 Two filters are used to remove the coarse impurities from the water. The hydraulic motor motion is transferred to the rotating body using levers. We can see the turbine shaft, thrust bearing, guide ring and below us there is the impeller and guide vanes. The turbine works in bi-directional mode (depending on the selected direction of water movement). If the water is pumped to the upper reservoir, the turbine turns to the right, if the water is let on the turbine, it turns to the left. In turbine operation, the vanes open and water pushes on the impeller and causes its rotary motion. While pumping, the impeller turns using the generator so that it creates centrifugal force in the vanes, which forces the water to the spiral and through the feeder channel to the upper reservoir. The discharge casing is a part of the turbine hydraulic circuit and its basic function is to remove water from the impeller to the tail race tunnel which falls into the lower reservoir. The top part follows the bottom turbine cover and continues with the discharge casing extension piece. Due to the cone disassembly the cone is divided horizontally into two parts joined using an assembly joint. The discharge casing is rated for the internal overpressure 1.34 MPa. 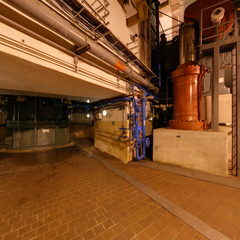 The pumping station equipment is located on the lowest floor of the engine room. It is used for first charging of feeder channels and upper reservoir. Water is pumped from the lower reservoir using tubing embedded in the lining of the tail race tunnel no. 1 and falls to the feeder channels before ball valves. The tubing is bi-directional in some sections. The suction tubing is provided with a pressure tank branch that functions as a pulsation damper in case of a pump failure. 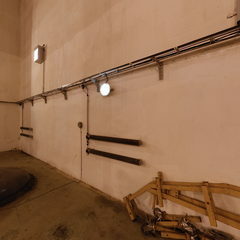 The deoiling space is used to collect the water that might come into contact with oil products. In the first blue tank the worst impurities are removed. From the first tank the water is conducted to the oiled sump, via gravity and sorption separators to the deoiled sump and after that to the river. The water is pumped to the river first using a small pump which checks the presence of potential oil products in the water. Only after the thorough check the large pumps are put into the operation. The control board transfers the electric signal from the control system to hydraulic valves, which subsequently start the admission of pressure oil to the control servo-cylinders. They swivel the guide ring connected by the pull rods with twenty vanes of the turbine guide wheel. The guide vanes open by turning the guide ring and the specific amount of water is admitted to the impeller; that way the turbine output is controlled. A unique starter mechanism starts the turbine unit to the pumping direction. The motor has 25 MW and it must be started via the resistance of starters that regulate the current to the starting motor. The starters are electrodes which are fixed in the lower part and movable in the upper part. The upper part approaches the lower one and the electrolyte between them creates the resistance against the current for the pony motor. After the pony motor switch is activated, the current passes through the fluid resistance and the pony motor starts to rotate under the electric current of approx. 2000 A. While the revolutions increase, the current reduces, thus the control system draws the electrodes closer, which increases the current and the pony motor increases the revolutions again. As soon the synchronous revolutions are achieved, the generator switch couples. The generator gains sufficient power, the pony motor disconnects, the space of the impeller starts to deaerate, the thrust increases, the guide ring opens and the turbine unit starts pumping water to the upper reservoir. The electrolyte in starters must be cooled down. In the generator body there is cooling for generator rotor and lower guide bearing. Unlike stator the rotor is only air-cooled. The fluid starter is used to control the stator current of the starting asynchronous motor and to increase its starting torque during the starting of the turbine unit in the pumping mode. The fluid starter with motor drive is designed to start the three-phase asynchronous motors with a slip-ring armature. The cooling equipment is designed to cool down the electrolyte of two starters. It is therefore common for both pumping units. 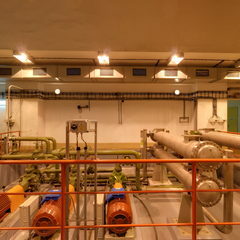 The cooling equipment consists of four water coolers, three pumps, connecting pipe, valves, instruments and armature material. The coolers are of the welded tube framework. The tubes where the cooled electrolyte flows are made of copper. Water is used as the coolant. The fire extinguishing system is used to provide protection of important technological elements (generators, generator transformers) during fire. 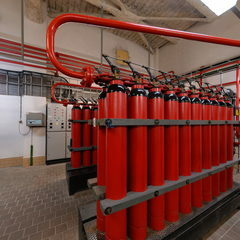 We use carbon dioxide (CO2), which is dangerous to life, as the extinguishing agent. The generator switch is used to disconnect the generator from the transformer. Together with it there are reversing disconnectors which reverse polarity of generator phases from the direction of the pumping operation to that of the turbine operation and vice versa. 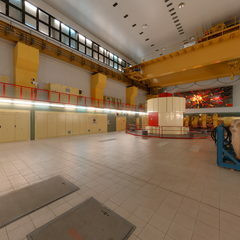 The transformer station of the Dlouhé Stráně power plant is unique in the fact that all transformers are three-phase. It is due to the limited space inside underground. The power is evacuated from the 22 kV generator to generator transformers using metal-clad conductors. They consist of an aluminium conductor with 350 mm in diameter, hold in the middle of the protective aluminium sheathing using three insulators. The access from the upper reservoir to the power plant is both along the outside access road, and through the bowels of the rock. 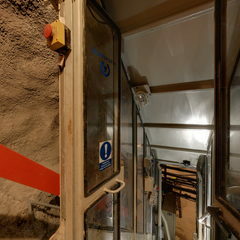 In winter, it is a problem to drive to the upper reservoir using the adjoining road; that is why a cable gallery was created first with 2500 steps and later a lift was installed for faster transport. 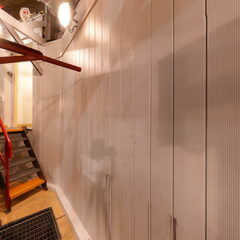 The lower part of the lift measures 392 m, then it is necessary to get off and walk across a corridor approx. 400 m long and after that get on another lift and ascend the remaining 318 m to the top at the upper reservoir. The travel by car outside takes approx. 15 minutes, while by lift from the control room it takes approx. 45 minutes. If you use the stairs, then it will take as much as an hour and a half. The vertical distance is approx. 500 m.
The tail race tunnels of the pumped storage hydro power plant fall into the structure in the lower reservoir; there is a bottom outlet engine room and inside there is a small hydro power plant. The lower reservoir is separated from the engine room using a slide gate. 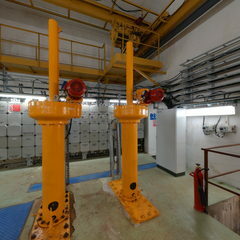 The slide gates from the TG1 and TG2 turbine unit outlets are controlled using hydraulic oil. It is located in the bottom outlet engine room of the associated structure. It uses the power potential of water outlet from the lower reservoir with power evacuation to the pumped storage hydro power plant auxiliaries and at the same time it is used as a flow rate control element. Francis turbine with the 400mm diameter impeller is constructed as the horizontal with the upper inlet, left-hand-rotating (looking from the coupling), and it is directly linked to the three-phase asynchronous generator. The power plant output is 162 kW. Left-click and drag to choose the viewing angle, or use the keyboard.